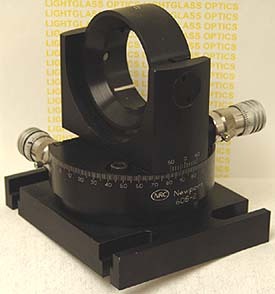 The Newport Newport 605-2 Precision Gimbal Optic Mount w/DS4-F Differential Micrometers is a precision tilt/rotation gimbal mount. This is Newport's best Gimbal Mount, which they describe as Ultra-Stable. Capable of holding optics up to 2 inches in diameter. The vertical Axis runs on pre-loaded radial ball-bearings, will rotate through 360 degrees, and the base is marked with a vernier scale. THe actual optical mount is Kinematic, as the receiving face of the mount has 3 polished ball faces to register the optical component into perfect and repeatable alignment. This has been upgraded to Newport DS4-F Differential Micrometers to precisely locate your optic to withing 0.5 arc second.